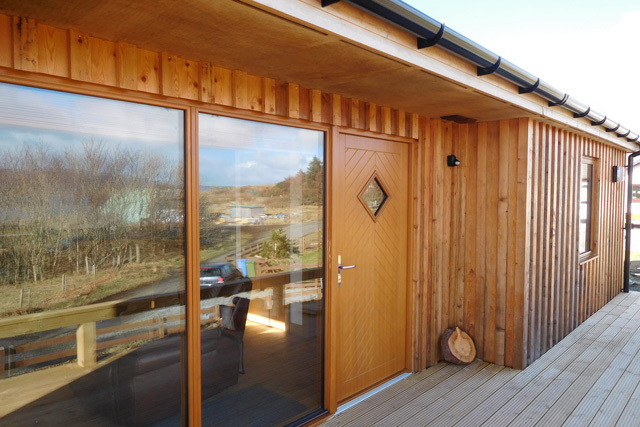 Pipers Lodge is a newly completed property situated in the small township of Borreraig in the North West part of the island. Sleeping up to two guests, the house with its striking timber cladding, would make an ideal base for exploring or for a romantic bolthole for a couple. 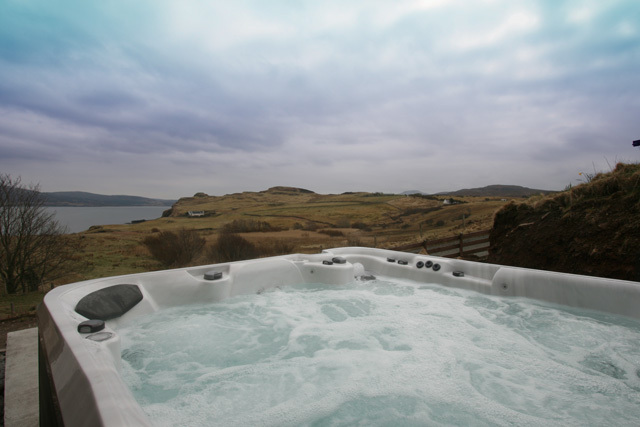 The hot tub makes Pipers Lodge a popular choice for a honeymoon, or for a short break which are available to book at all times of the year. Inside the property guests will find it open plan with the sitting, dining area and kitchen being one. With the floor to ceiling windows ideally positioned to take full advantage of the views. 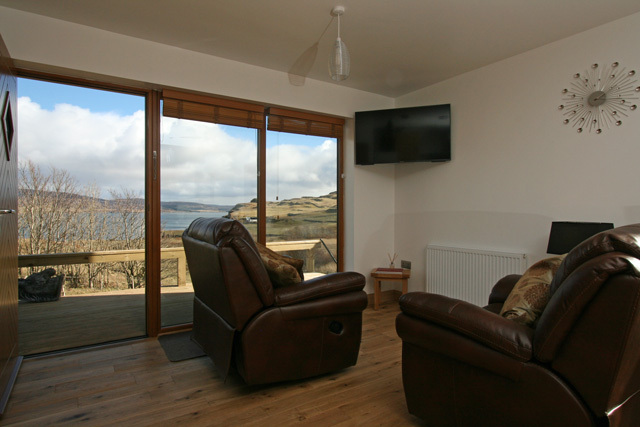 The sitting area has two leather reclining chairs and a large flat screen TV, the kitchen is well equipped with all the usual appliances including a double oven, gas hob, dishwasher, and the dining area has seating for two. 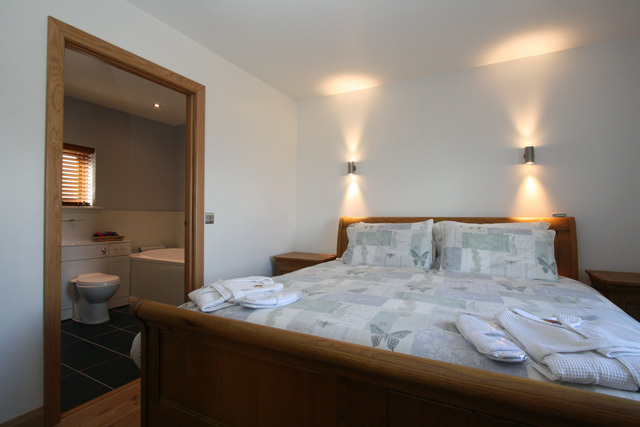 The bedroom has a beautiful oak super king bed, with the owner providing good quality bed linen, towels, bath robes and complimentary slippers. 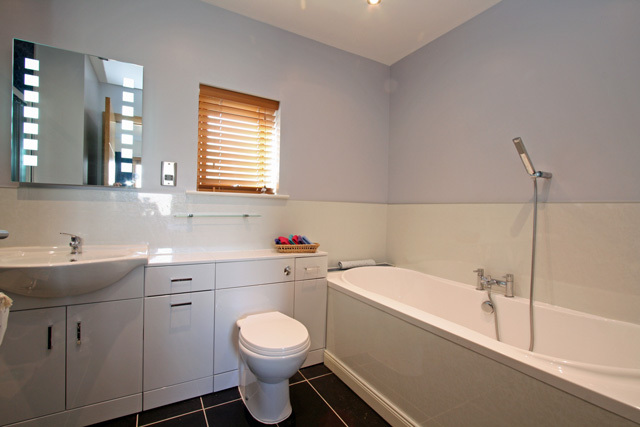 Off the bedroom the spacious bathroom has a double ended bath, ideal for relaxing in after a day in the surrounding hills and a large shower. 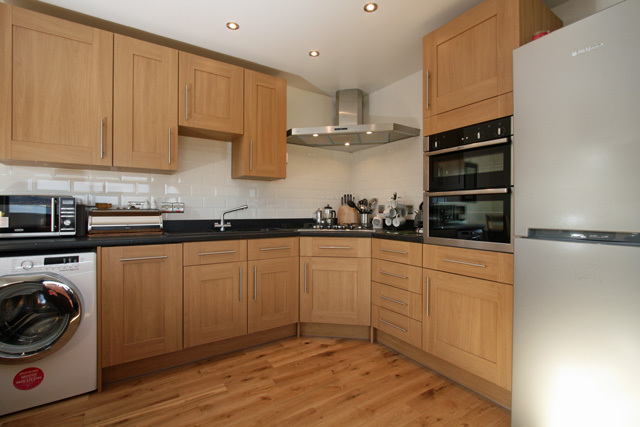 Throughout the property has been furnished and equipped to a high standard. 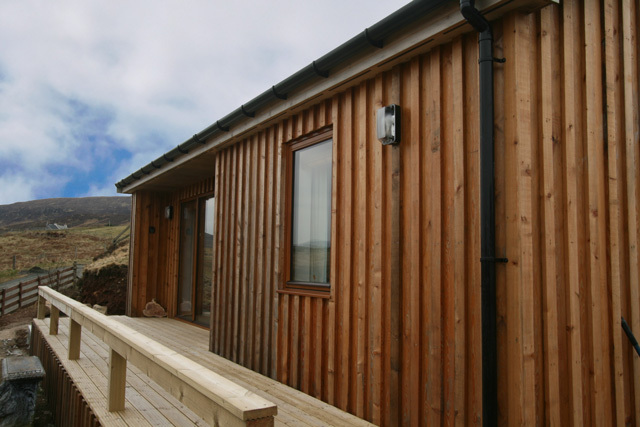 Outside Pipers Lodge has a decked terrace with a hot tub and parking for two cars is provided. The owners live close to hand and are available if required. The nearest facilities to the property can be found in Glendale (3 miles), which offers a small shop and a couple of cafes (seasonal), a particularly popular one being the Red Roof Café. 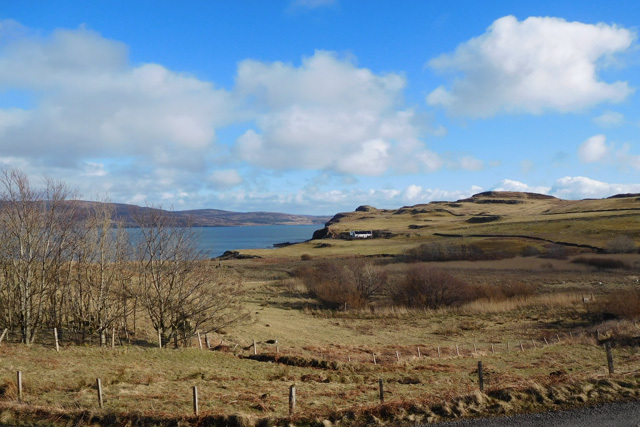 Further afield the larger settlement of Dunvegan (8 miles), offers a better range of facilities, including restaurants, petrol station and some small shops. On the outskirts Dunvegan Castle, the ancestral home of the Chiefs of Clan MacLeod for 800 years, can be found. The castle and grounds are ideal for exploring, and tours are available, together with these the castle also offers boat trips, a shop and the Macleod Tables Café. Closer to the property the Three Chimneys Restaurant can be found; the restaurant has won a host of accolades and has been voted in the top 50 of the world’s best restaurants, an ideal place for a romantic meal or special treat. The most westerly point on the island can be found at Neist Point, the area is home to some of the most striking coastal scenery on the island, with large cliff faces and unusual rock formations, which are often compared to the Giant’s Causeway in Northern Ireland. The point is considered the best place on the island to see whales, dolphins, porpoises and basking sharks, and for bird watchers the area is home to a large population of sea birds. The area is also a popular choice with walkers, and the quiet country roads ideal for the cyclist. The more agile walker might even want to attempt the flat topped peaks of Healabhal Beag or Healabhal Mor, otherwise known as the MacLeod’s Tables which are located just a few miles away. Further afield the island offers many other attractions and places to visit including Talisker Distillery and the town of Portree with its pretty harbour, which is the base for some of the islands many boat trip operators. 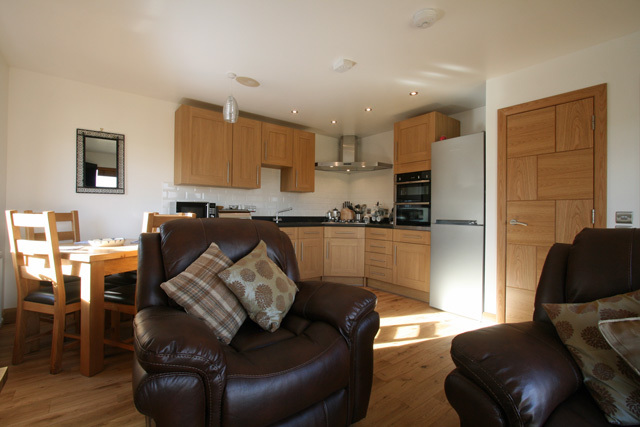 Sitting room, luxury leather reclining armchairs, large flat screen TV with Freeview. Kitchen area, twin electric ovens, five ring gas hob, fridge/freezer, microwave, dishwasher, washing machine, dining table with seating for two. Bedroom with super king bed, access to bathroom. 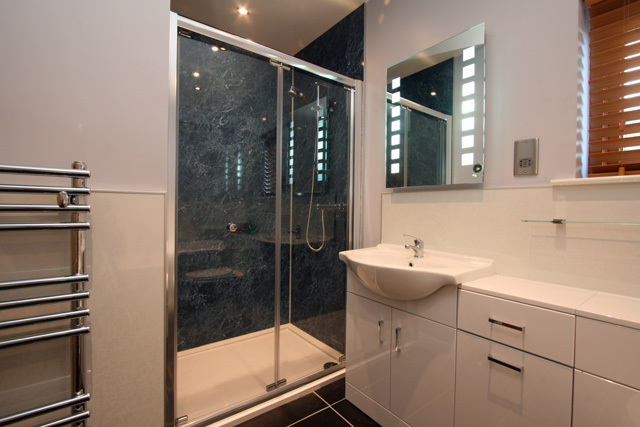 Bathroom, double ended bath, walk in shower, wc, whb, heated towel rail. Indoor & outdoor drying facilities. Decked terrace area with hot tub. 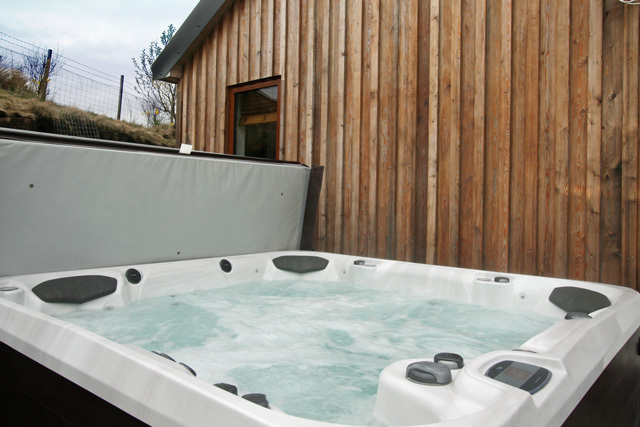 The use of the hot tub is included in the rental price, a disclaimer will have to be signed prior to the rental. Depending on the network mobile phone reception may be poor, however we have been advised that the Vodafone, EE and O2 networks are available. Please note that due to the size of the property, babies and children are not allowed. An ideal romantic bolthole - complete with hot tub. Quiet location with amenties of Glendale close by. We had a lovely stay over New Year. 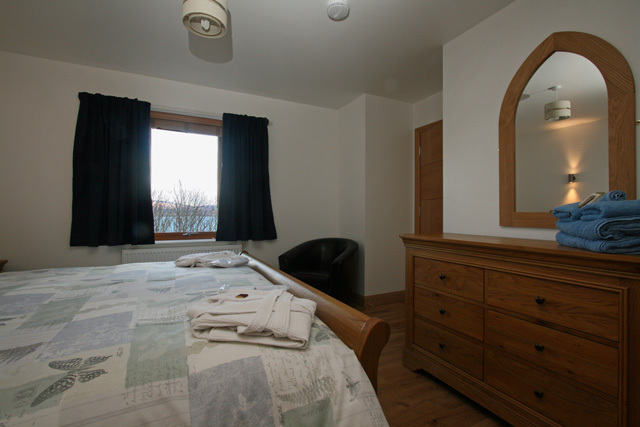 The lodge had everything you could whish for and everything was top quality. Sitting in the hot tub under the stars on a cold winter evening was magical.